In today’s business ecosystem, multi-billion-dollar companies are built on the promise of ensuring the validity and execution of contracts. Both time consuming and costly, the process of mediating contract execution impedes efficiency and is often left up to the discretion of human decision-making skills. However, with the invention of blockchain and smart contracts – digital contracts with guaranteed authenticity, validity and execution – we have the ability to revolutionize the way we conduct digital contracts and business. 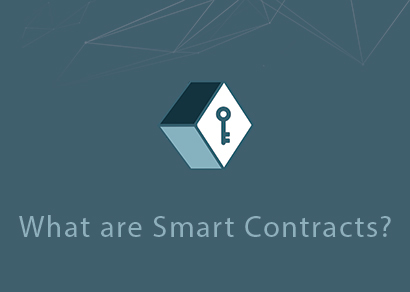 Smart contracts are one of the most powerful applications of blockchain technology today. They integrate an immutable set of conditions and corresponding actions into code, that once activated, self-execute. In simpler terms, they facilitate a coded agreement in a trustless, automatized way. These digital contracts can be coded to automate thousands of different transactions and business operations in a fully compliant, decentralized way. Smart contracts can facilitate money transferals, property sales, share distributions, or almost any other value-based transaction. 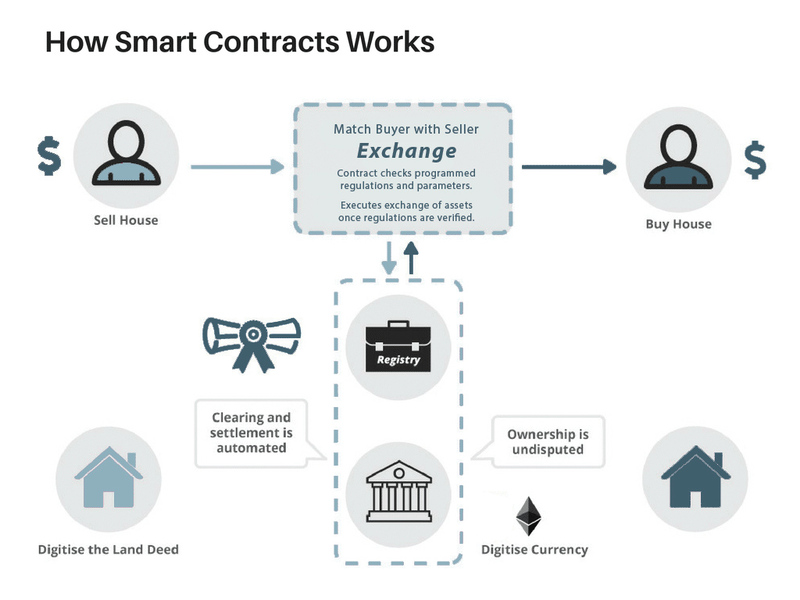 Additionally, smart contracts cut out a number of traditional steps and middlemen, making these types of contract settlements close to instant as they only rely on the buying and selling party. Smart contracts also simplify trust by being completely transparent and auditable. Here is a rudimentary example of how such a contract could work. First, a selling party will create a contract which digitalizes their own asset’s ownership, let’s say their home. Within the contract, the selling party will additionally set a selling rate and any other conditions they see fit for the sale. The contract is then published and will continuously check prospective buyers to see if they match all set conditions. If a buying party meets the required conditions and fulfills the stated asking price, they will be sent back a tokenized claim to ownership of the asset. In this case, we will assume the buying party buys the home outright and will receive the deed to the house through this digital transferal process. However, in most other cases, the quantity of such tokenized ownership will be proportional to how much of a said asset the buying party sent to the contract’s address. Note that the selling and buying parties will be the only two involved in such a transferal. This contract can also be reviewed and verified at any time by anyone, once it is fully published. This type of peer-review helps to ensure that these contracts are legitimate and truthful to their descriptions. Despite this transparency, this type of contract review requires a high-level computer science background or a third party to audit its code. Besides defining contract quantities for buying or selling assets, smart contracts can outline and add more specific parameters such as penalties for foul behavior, required user qualifications, or time periods for their agreements. Automated, auditable and fully decentralized in nature, this new form of self-executing contracts will have a profound impact on the way individuals and society as a whole interact in the future. The most common use of smart contracts today is initial coin offerings or ICOs, which have largely taken place on Ethereum’s platform. When a smart contract is used for an ICO distribution, an individual investor will first send Ether to the given contract’s address, once their transaction has been confirmed by the network, the new token will be sent back to this initial investor. It is important to point out that these new tokens promise to serve specific roles from project to project. They do not act like stocks — there is no guarantee of any ownership, voting rights, or dividends — despite some tokens working in a similar fashion. This process is accessible by anyone with internet access, allowing people from around the world to participate and fund other blockchain based projects. With this being said, certain projects may require KYC or AML checks, restricting particular users from participating in these selected contracts. Ethereum is not the only platform which users can develop and host these smart contracts. There has been an increasing number of other platforms on the market that enable developers to code these digital contracts. Some of the larger examples are projects like NEO, Stellar Lumens, Lisk, or even EOS. Many of these other platforms are attempting to take a chunk out of Ethereum’s market share by taking innovative approaches to their respective protocols. However, Ethereum by far holds the largest market cap, following, and activate participants out of any other smart contract platform. In fact, some of these projects like EOS have even started their own journeys on the Ethereum blockchain as an ICO token. Smart contracts are the most revolutionary implementation of blockchain technology since its creation. The amount of freedom and growth that a smart contract can generate is immensely larger than any other production tool in the space. Platforms aimed at hosting and fostering this innovative technology have played an imperative role in bringing blockchain technology mainstream. The disruptive effect that these platforms will lead across a multitude of global industries will play a key role in the overall development and integration of blockchain technology in our lives.